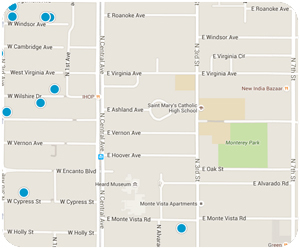 Generally located along Hoover, Vernon and Ashland avenues between Central Avenue and Third Street in Phoenix, Arizona. Bungalow with backdrop of city skyline, anyone? The moderately priced single-family homes of Ashland Place Historic District are just a few steps from the business and residential towers along Central Avenue to the west, creating a unique juxtaposition of residential yards and commercial density. There are some magical sunset views from Ashland Place as a result. The exclusive homes of Alvarado Historic District and the impressive Heard Museum are neighbors to Ashland Place on the south. And the Phoenix Art Museum is a short walk down Central Avenue too. 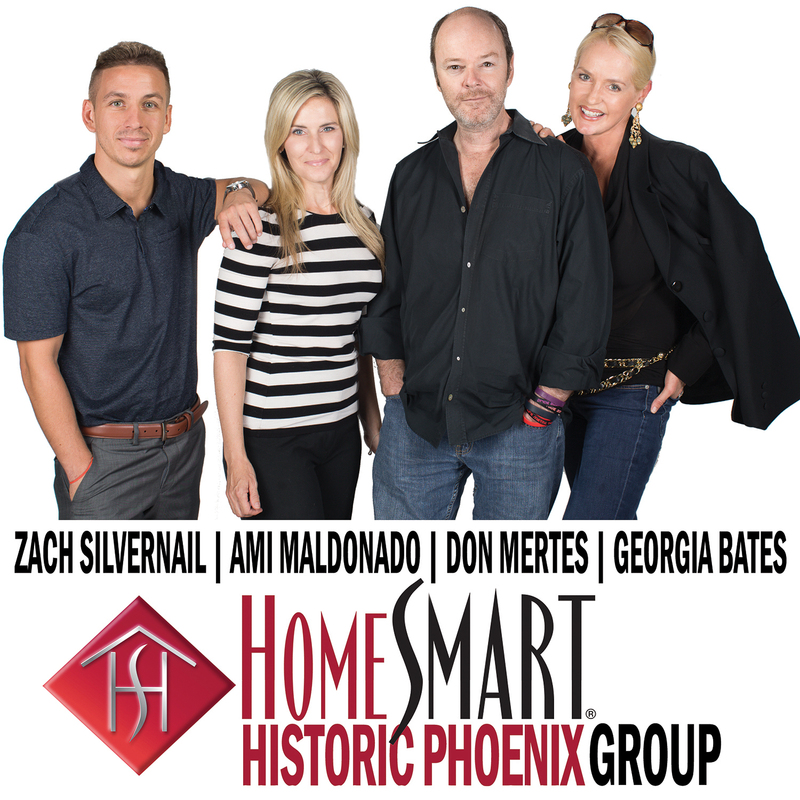 The homes in Ashland Place Historic District were originally envisioned (by Mr. Heard of Heard Museum fame) to be large estates with acreage like those in neighboring Alvarado but were re-subdivided into smaller parcels in response to the Phoenix real estate market of the late 1920s. 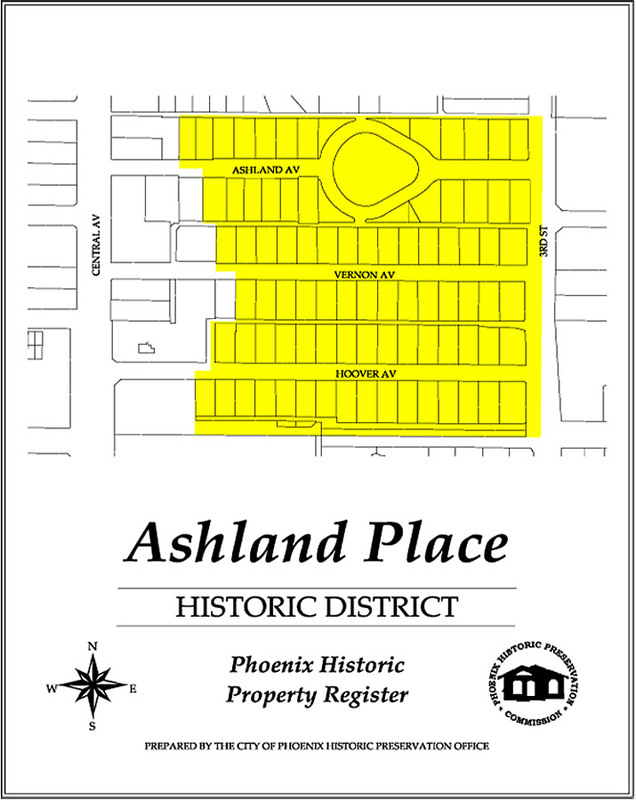 As a result, Ashland Place has compact lots with smaller and more affordable homes (68 of them according to the Historic Preservation folks at the City of Phoenix). Classic Period Revival style homes– predominantly Tudor Revival, Spanish Revival and Bungalows with charming detail–can be found along Vernon and Hoover avenues. They average about 1300 square feet. The homes along Ashland Avenue were built a bit later and so are roomier Ranch-style homes that average closer to 1500 square feet and generally have 3 bedrooms and 2 baths. Ashland Place Historic District was a desirable address when it was developed back in history and it continues to be a desirable location today, well connected to the rest of the Valley by the new light rail and walkable to many businesses, museums and restaurants. If you love the homes in Ashland Place Historic District but can’t find one for sale, you might also like Country Club Park or the East Alvarado historic districts (Ranch style) or Del Norte Place (Period Revivals). If it’s the connectivity to the light rail and proximity to Central Avenue that draws you to Ashland Place, check out the Willo and Pierson Place historic districts. They are pretty well connected too. Meet some of the neighbors who make Ashland Place such a great community.